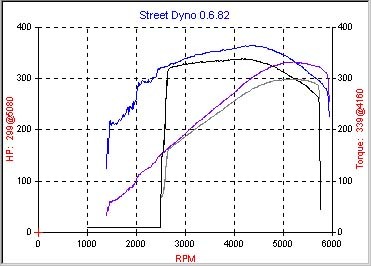 A 377ci Windsor, with all the good stuff, was tested on a Street Dyno. The stock clutch fan was virtually identical to the flex-fan, actually having a 1 HP advantage. So there you have it, going electic can save ya ~25 HP & 25# !!!!!!!! I'm using an early Lincoln Mark VIII fan, which was discontinued cause the wicked fan pitch was supposedly too noisy. I got it from the wrecker for $50. Unfortunately the electric motor only lasted a year (Siemens is having trouble with a lot of their motors). I replaced the motor with a new SN95 piece (it was available for about $80)... adapting the older blade required a longer dowl pin (home depot). The newer Mark VIII fans are similar to the SN95's, but the SN95 shroud doesn't need trimmed. Keep in mind, these factory fans were designed to last a lifetime, even in Florida heat, with the air conditioning cranked! Another option might be the 18" monster fan from Vintage Air, which is supposedly good for 1000 HP! (kinda looks like the old Mark VIII). You should upgrade to the newer 3G, 130 amp alternator while you're at it. Make sure you run a heavier wire (4 guage?) from the alternator to the silonoid, as the stock wiring (10 guage?) is barely adequate for 65 amps in hot underhood temperatures. I'm using the Variflow controller, but it's no longer available. Apparantly the Mark VIII fan can draw more than 30 amps, and the controller is limited to a 25 amp output, so I'm not getting the full current/speed. Fortunately, when a fan is running at half current, it still draw's 80% of it's maximum airflow... so I'm not really loosing that much. It's nice how it only comes on when necessary... even if the engine is turned off! Anyway, you can get thermostat controls through Summit or Permacool. The Black Magic fan doesn't draw as much current, so it works with the stock alternator. Unfortunately, it's only rated for 225 HP (without air conditioning), so it's generally not applicable. If you're having cooling trouble, try a 180 hi-flow thermostat. If you're running an underdrive crank pulley, pick up a 93 cobra overdrive waterpump pulley. Make sure the exhaust is free from restrictions (plugged muffler, or even just the 4 cat H-pipe, which should be the first to go). Also, consider a cooler spark plug (which should actually conduct about 15% of the heat to the waterjacket).